Mentors At Work is pleased to offer the collision repair industry a tool to reach out to new talent. 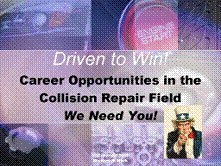 Entitled “Driven To Win!”, this PowerPoint presentation highlights the rewarding career opportunities available in the field of collision repair. Click here for a fact sheet/order form. Developing skilled staff is important to you and your business. Nothing gets done until human hands touch the work to be done and only highly-trained hands can work in today's technical workplaces. Too many businesses "wing-it" when it comes to training new people or moving employees up the ladder. They have no effective plan in place, no road map to follow, their trainers are under-prepared, there is often little or no tracking system in use and not much, if any accountability. Mentors @ Work has a solution to all of these challenges and more! Mentors @ Work provides an effective occupational mentoring/apprenticeship system to build the employees you need within your own company. Using one-on-one, on-site training and on-line tracking, you will be better able to attract, train, and retain the skilled employees you need. Early on in the establishment of your new mentoring/apprenticeship program, Mentors @ Work's highly-trained staff (mentoring experts, coaches and personal trainers) will walk you through the program, step-by-step, seeing to it that you are off and running toward the successful training of new employees or moving current employees up. Because managers are often too busy to dedicate the time to effectively manage a full-fledged apprenticeship/mentoring program. Mentors At Work created a special enhancement called "We'll Manage It!". This new enhancement removes what is often the final hurdle to the establishment of a true apprenticeship/mentoring program. Click Here for more details. Mentors @ Work also provides one-on-one assistance to businesses that want to establish effective in-house training and employee development programs. Workshops and seminars are periodically held in various parts of the USA to assist businesses in a number of industries. Let us show you how effective Mentors @ Work can be for your business! Tell us that you want to Participate in a FREE Demo or phone consultation. Read some Testimonials from a few of Mentors @ Work's customers. Each Mentoring system is specifically designed for a particular industry, plus there is a special mentoring module you can customize for your industry. Find out if there is a Mentors @ Work system for Your Industry. The Mentors @ Work System provides free Mentor and Apprentice candidate evaluations. Click Here for a FREE Evaluation!